Don’t panic, I’m alive and have been having a wonderful few months since Williamsburg in November! So wonderful that I can’t seem to find time to post. The better news is that now I have a ton of restaurants and experiences to share … so here we go. The Pig – 1320 14th St. NW – Can you guess by the name what kind of cuisine we enjoyed? The menu was extensive and inventive in all things pork. Bacon wrapped apples were a favorite, but many other things appeared in plates to share: brussel sprouts, outstanding grits, and even a pig’s foot or a “crispy trotter.” John ordered one and shortly afterward the chef came to our table to visit and brought a very thinly sliced piece of pig cheek (I think). It was basically charred fat .. and it was ridiculously good. Lincoln’s Waffle Shop – 504 10th St NW – A greasy spoon with an odd shape and even more curious characters was our choice for Saturday breakfast. Next to historic Ford’s Theatre and rife with references to Honest Abe, the menus are tall and plastic and customers brush elbows in community-style seating. The service is fast and the food is stunning, Northeast, diner-good. Shake Shack – 800 F St NW – All the rage in Baltimore right now on the Inner Harbor it appeared on our radar and was hard to resist. The call of serious burgers and milkshakes was too strong! I think the chain meets the hype and and my other half is still talking about the milkshakes (just right). Kramerbooks – 1517 Connecticut Ave NW – Highly recommended across several review sites this place plays host to two of my favorite things: books and food. After a short wait I received a text letting me know my table was ready. Winding back into the cozy dining area I chose comfort food in a Reuben sandwich and a glass of Malbec. The dessert case is viewable from the bookstore so I also had to take a slice of perfectly tart key lime pie to go. Newseum – 555 Pennsylvania Ave. N.W. – Originally when we were looking at museums we were largely focused on the free experiences around D.C. A friend recommended the Newseum and we read a fair amount online before making our decision. This was well worth the admission price for anyone – media hound or otherwise. One exhibit I enjoyed immensely is “The Boomer List” on display now through July 2015: Awesome self portraits and short stories of 19 individuals born in each year of the Baby Boom generation. Hotel Helix – 1430 Rhode Island Avenue N.W. – A hotel in the Kimpton brand, which never disappoints. Quirky and stylish and in a great location in the N.W. The free happy hour is a great way to wind down (or up). They do have a small garage where you can park your car for a fee, or free, if you get a wink from the travel gods like we did. Windsor Inn – 1842 16th Street, NW – Working to / from Dupont Circle made this old building a good find in a residential area. Because of its age there is some general wear and tear but if you’re only going to rest your head for a few hours a night, it’s a great spot. Plenty of character in the room furnishings, and a house cat named Mona. A long delayed post on the beauty that is Oakland, California. My annual conference for work brought me to San Diego and I had to tack on some time in the north. My first foray to California was in Los Angeles back in March 2013 so it’s only fair I continue to stack up the cities and appreciate this massive state. Turns out when you leave your house in Baltimore at 4 a.m. and arrive to SFO at 9 a.m., you can get a lot done in a day. Here’s a look at some of the awesome eating, drinking and wandering we did in Oakland. It’s not the hood you think it is (if you grew up on the other coast listening to rap about the West Coast). Details and web addresses follow. Grand Lake Kitchen: http://www.grandlakekitchen.com Quick to get my fix of MexiCali food, I opted for chilaquiles and was not disappointed. Friday Nights @ OMCA (Oakland Museum of California): http://www.museumca.org/friday-nights-omca Food trucks and a rocking band and the open air, right on beautiful Lake Merritt. Boot & Shoe Service: http://www.bootandshoeservice.com/ Crispy, bubbly, beautiful pizzas. Do I really need to say anything else? Ok one of them had fingerling potatoes on it..
Chinatown: Every city has one! We managed to grab bahn mi sandwiches and bubble tea while strolling around the area. Jack London Square: http://www.jacklondonsquare.com/ Home to a farmer’s market and some great people watching, I really like this area. Heinold’s First and Last Chance: http://heinolds.com/index.html Located in Jack London Square, it’s a very cool piece of history related to the writer himself. Boca Nova: http://www.bocanova.com/ Also located in Jack London Square, we had a divine brunch al fresco including scallops and a perfectly poured cup of coffee. Great for posh post-Farmer’s Market snacking. Champa Garden: http://www.yelp.com/biz/champa-garden-oakland This hole in the wall in East Oakland was unbelievable. A mix of Thai / Lao cuisine in a laid back atmosphere full of foodies. Doughnut Dolly: http://www.doughnutdolly.com/site/page/home now in Oakland and Berkeley, these handmade donuts filled before your eyes are a great way to start the day. Have two! The dine around town continues! Shoofly Diner – 510 East Belvedere Avenue, Belvedere Square – A delicious location with a newly touted rating as one of “100 Best Bars in the South” per Southern Living magazine. We traded the bar scene for the breakfast table and feasted on beignets, chicken & waffles and general awesomeness. Nordstrom Café – 700 Fairmount Avenue, Towson Town Center – If you’re tired of (or turned off by) food court cuisine, this cafe tucked into the Nordstrom store is fantastic. Arguably some of the best hummus I’ve ever had in my life, and even when the presentation is in a to go box, it’s still impressive. Cunningham’s – 1 Olympic Place – One of the Bagby Group restaurants nestled into the very heart of Towson, just beyond the circle. Their happy hour specials are truly phenomenal: priced right ($2 – $6 appetizers), delicious (brown butter popcorn) and paired with wine, beer or a well-made cocktail (also $2 – $6). With a beautiful terrace outside and a stunning full restaurant indoors .. and complimentary valet parking in the garage .. this place is perfect. Happy hour is Monday – Friday from 5 to 7 p.m. The Prime Rib – 1101 N. Calvert Street, Baltimore – ranked as one of the most romantic restaurants in town, the girls and I took the opportunity to dress to the nines and enjoy an evening out. I’m happy to say that my leopard print pumps matched the carpet! The decor is dark and moody and classy and several decades old, which only adds to your tux-clad waiters, live piano music and the absolutely tremendous steak served to your liking. What I ate. Colossus bagel with cream cheese & lox. How do you say no to a bagel by that name? It’s important to know that here the bagel is not about size (which many Yelpers have a fit about) – it’s about a colossal flavor. Rather than read the laundry list of ingredients, I ask Greg the owner exactly what is on the bagel. “The goal is to use very seed there is,” he tells me. I mention the cumin that sneaks up in the end after you’ve finished a bite and he commends me on my palate. Thank you sir, – toss me another! On lox. This place is lox heaven. The list of types of lox is truly astounding and I’m not going to lie, I don’t know a damn thing about lox. After reading the reviews I turned to Google in an effort to understand the differences. Thanks to some intrepid foodies I learned a bit about the brining process and the way the salmon is cured .. then I got hungry and left. I asked for Norwegian lox because it’s at the top of the list. Kathy, Greg’s wife asked me if I’d ever had it before – clearly my ignorance was shining – and when I said I had not, she made a kind recommendation for the Scandinavian which was better that day. She was not wrong. The price. They really are giving it away. A small chai latte, $1.75. Bagel with plain cream cheese and lox: $6.75. Don’t forget this place is cash only, but there’s an ATM across the street if you need it! Attention to detail. I’m seated comfortably at a small table nestled up against the glass case, watching the parade of souls in the front door. I can hear the pack of high school students chattering behind the counter, and customers calling out “Hi Greg!” as they come through the door. The man in question runs by my table and stops to ask what I think of my bagel choice, bending down to take a look at my progress since I left the counter (I am delicately demolishing the thing). On the way back to the register he stops and talks to a young dad and his two little ones to confirm that their bagels are perfect. Dad has a mouth full and gives him a thumbs up in satisfied silence. I concur. Accolades & competition. A runner up for Baltimore’s Best Bagel in 2013, the winner Towson Hot Bagels is also a gem although it has the chain atmosphere and three locations (and rather creepy homepage music). Last words. A well-run small business with affordable breakfast, a great location and a cozy atmosphere makes Greg’s the perfect spot whether you’re dining in or flying out the door with a brown paper bag. Either way, you will leave planning ahead to the next time you’re coming back. Once upon a farm, there was a girl named Maggie. Actually, there is no Maggie. And there is no farm, either. It’s always a good sign when the restaurant where you’re about to dine has a sense of humor. You already know how I feel about brunch. Pass me a menu that will knock my socks off and pour me a Bloody Mary. Or in the case of a Sunday brunch at Maggie’s – pass me a slice of cardamom coffee cake while I wait (quite nice, as we were parked in the teeny waiting space for about 15-20 minutes). Homemade doughnuts. Crispy brussel sprouts. Deviled eggs with onion & caviar. Oh hello, I haven’t even left the Small Plates section of the menu. Although inspired by the sound of the Fried Chicken & Rosemary Waffle, I saw said entree delivered to a patron next to me and it was GIGANTIC. I should have known, they had me at sammie. I love a good breakfast sandwich, particularly when so many of the ingredients are homemade. The Chik n Biscuit was tempting, but after reading about the Young Choreezy, I was all set. MF chorizo – you may think that stands for an explosive adjective but really it’s Maggie’s Farm. But after you taste it, you may revert back to your first guess – it’s that good. Keeping it local they are also serving Zeke’s coffee, from the next door small batch roastery. I spotted the homemade chorizo the night before on the chef’s Instagram feed @maggiesfarm_md. If you do anything with your social media, get on the stick and watch his photos. Everything from lamb to grits to bread to chicharrones for their Mexican Popup this past weekend. With events like these, Restaurant Week in February, and dinner / late night hours, the MF staff is quite busy. 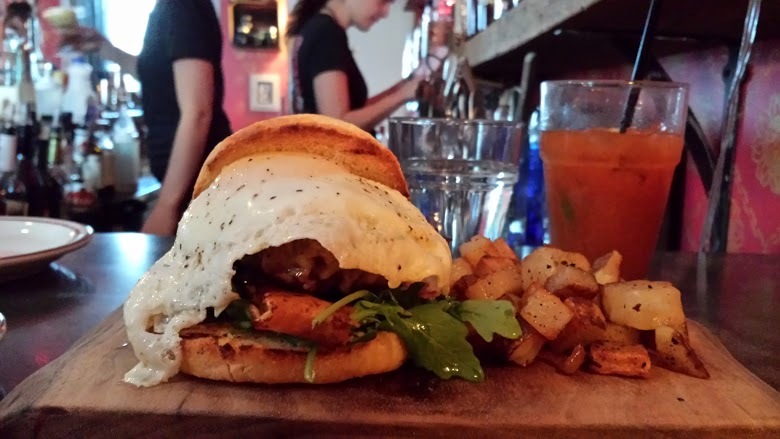 Thanks to a recent Twitter convo, I will also spread the rumor is that Saturday brunch will soon be upon us! Tucked into a tiny strip of stores and previously home to the Chameleon, Maggie’s is an intimate space with a reservation list as long as your arm. Bar space was available when we got in at Noon on Sunday, a table would have meant waiting until 2ish. I felt guilty about parking in the nearby Safeway parking lot but apparently that’s the place to be. So, the answer to your next question is yes. This meal was as good as the photo. And I ate the whole damn thing. Keep on rocking, Maggie’s Farm – you are delicious.